Carefree Velva Sheen is a premium plus 100% acrylic low sheen interior/exteror finish which provides block resistance with superior washability, scrubbability and exterior durability. This velvet finish exhibits exceptional stain and dirt resistance with good hide and adhesion. 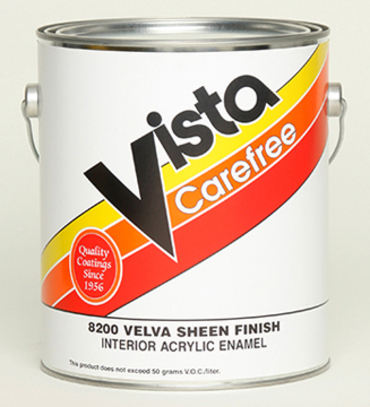 Carefree Velva Sheen can be applied on drywall, plaster, stucco and wood. Excellent for use on commercial, residential, institutional or custom painting projects. NOTE: This product contains ingredients which resist the growth of microbes on the surface of the paint film. Recommended Uses: Properly primed interior drywall, plaster, concrete, masonry, wood and metal.